Cretan cuisine is one of foundation, not of complicated sauces. Its strength lies in the quality and freshness of its ingredients, the use of wild herbs and greens, and purity of taste. And not to be forgotten, the copious use of olive oil, Crete's liquid gold. You smell the stink, but you hear the scent! — Viki, one of our guides on the Greek island of Crete, captures the philosophical essence of Cretan cuisine. We'll touch on the ingredients and philosophy of Cretan food before diving into some of our favorite appetizers and sides, mains, desserts and drinks — and where we consumed them. The goal: so you don't come to Crete looking only for gyros and souvlaki. When it comes to Cretan food, you could say it features the three F's: freshness, fragrance and family. As we drove from Heraklion, the provincial capital of Crete, civilization quickly yielded to nature. “Pull over here,” Viki implored us as we made our way into the hills. We did. She hopped out of the car and scampered off the side of the road, and returned a minute later with armfuls of wild sage, oregano, thyme and marjoram. The car filled instantly with fresh and fragrance. It was out of this world. The Cretan countryside smells of wild herbs and flowers. Oregano is perhaps the most common herb used, but sage, thyme, parsley, marjoram, basil (different than Italian basil), fennel, and dill also play a prominent role. On Crete, you'll find them used on salads, in dishes and also in beautiful, cleansing blends of herbal tea. Maybe so, but we were still impressed by the selection of local produce in the markets. Every time we went to a restaurant we learned that the food came from a nearby farm or village. And it tasted that way, too. From pomegranates to peppers, Cretan produce is all about the crisp, the fresh, the retained flavor. Olive oil is the most important ingredient in Cretan cuisine. Virtually everything has a spoonful (or two or three) of olive oil thrown on top. Some Cretan dishes even swim in the golden liquid, only to their benefit. Savory pastries are fried in olive oil. Try french fries in olive oil and you'll be spoiled. Crete features over 1.5 million olive trees. If you are born on Crete, it seems like a birthright that you own at least a few. Olives ripe for the picking. To place the importance of olive oil to the Cretan diet in perspective, consider that average olive oil consumption in Germany and the United States runs about 0.5 liters/person annually. In Crete, it’s 25 liters per person per year. The best and healthiest olive oil, natural to Crete, has acidity levels of under 1, with 0.3-0.6 being the ideal. Before jumping into our favorite eating experiences on Crete, a note on the local style of eating. Family style is the name of the game: everyone shares. Agreed. Community eating binds us, and it just might make meals taste that much better. A very typical Cretan dish. Rusks, a traditional dried bread that is baked several times and kept for months, is moistened in a bit of water, and topped with grated tomato, olive oil, cheese and oregano. Crunchy, light and full of flavor, it makes a perfect snack. Artichokes, wild onion bulbs, black and green olives are just the beginning of a mountain of marinated appetizer goodies that you'll find on Crete. If small plate eating is your thing, this is where experience begins. Fresh beans cooked with a little crushed tomato and olive oil. The simplicity of this dish belies its taste and reminds us never to judge a book by its cover. Stuffed grape leaves, usually with a rice, herb and ground meat mixture. This dish is not specific to Crete; it's popular throughout this side of the Mediterranean. There's certainly no shortage of cheese on Crete. Among the main varieties you'll find: anthotiros, a sheep and goat cheese that's mild and soft when it's fresh and salty and earthy when hard; kefalotiri, a firm sheep or goat cheese, and mizithra, the typical fresh cheese of Crete made from sheep's milk (and when made from goat's milk it's called katsikithia). Graviera, the typical hard cheese of Crete is usually made with sheep’s milk. Although the name sounds suspiciously like gruyere, graviera is nothing like its Swiss sister namesake. Also delicious when fried and served hot. The best introduction to Cretan cheese is a walk through the market (preferably with some knowledgeable locals) and sampling visits to a handful of cheese stands. We did our Cretan cheese deep dive at the Atsalenio Wednesday market in Heraklion. Sheep’s cheese-filled pastries fried in olive oil. Named after the iconic traditional scarf, of the same shape, worn by the men of West Crete. We ate these fresh at the women's cooperative of Idaia Gi in the mountainous village of Gergeri (on the way to Phaestos). Decadently rich and creamy, this stuff is to die for. The local Cretan yogurt variety is made with sheep's milk instead of cow's milk. Top it with honey, nuts, and some fruit for one of the most beautiful (and healthiest) breakfasts on the planet. A pastry crust stuffed with a slightly sweet Cretan cheese mixture (often including mizithra). Their sweetness implies dessert, but they are also served as appetizers. Where to eat it: For a vast spread of Cretan appetizers and nibbles, head to Agreco Farm outside Rethymno. Many of the appetizers you see above were devoured there. It’s an organic farm with a nice view of the coast; food is fresh and top notch. Also serves a full Cretan feast for dinner. Fresh snails cooked with olive oil, salt, onion and red wine served in a cracked wheat stew. You’ll never look at eating snails in the same way again. Added bonus: you will also earn serious Cretan cred by eating this dish. We're told many travelers shy away from it. Not only did we enjoy eating it, but we felt honored to have been served it. A rich, filling staple of Cretan weddings. Cretan wedding rice is made by boiling a side of sheep (we’re told older sheep are better for this dish) for hours and hours so that the meat becomes fall-off-the-bone tender. Served with rice cooked in sheep broth. It may sound boring, but the richness and depth of flavor will surprise you. I heart artichokes. So imagine my excitement when we were served a dish overflowing with artichoke hearts stewed with wild hare (or the next door neighbor's rabbit) and crushed tomatoes. I had to really work hard not to eat myself sick with this dish. Where we ate it: We enjoyed the main dishes above at Kalliope Kehadiadaki's Taverna in the village of Apostoloi in the hills just southeast of Rethymno (Tel: 30 28330 61285). Kalliope’s cooking is famous with locals and visitors alike. And, she's a sweetheart grandmother. There’s no menu; just chat with Kalliope regarding what she has fresh and what you like. Ingredients come from her family farm or from other farms in the village. Very reasonably priced – €10-€15/person for a feast, including her husband’s wine and raki. The journey into the hills to find it is worth it. Special thanks goes to our guide, Ioanna Glypti, for introducing us. We would never have found it without her. Pork (usually) and potatoes slow-cooked in a traditional Cretan wood-burning oven. When the oven is hot enough, the wood coals are removed and trays of pork with potatoes are placed inside. The oven door is then sealed so no liquid or air can get out or in. Cooks for about 3 hours. It may not look like much in the photo below, but it is truly delicious and tender. Where we ate it: Seli Ambelou, a family run taverna near the Venetian windmills on the way to Lassithi Plateau. This place is full of Cretan families on Sunday out for their weekly meal. We were surprised to learn that although Crete is an island, people don’t eat seafood as much as they do meat. One reason for this is that overfishing has pushed up the price of seafood. When you do find local seafood, it’s usually cooked lightly in olive oil. Worth a splurge. Where we ate it: Taverna Spinalonga ARIS in Plaka. A great place to have a long seafood lunch after visiting Spinalonga island. Candied fruit may sound boring. But when done right, it can be terrific. In this case, take the sour perfume-fragrant skin of a pergamont (pergamonto, or bergamot orange), candy it in sweet syrup , serve it with fresh yogurt and side it with raki. Never tasted anything quite like it. An inspired finish to a meal. Like hand-made donut holes fried in olive oil and topped with honey, cinnamon, and finely ground earthy bits like sesame or nuts. Decadent. Pastry filled with cream and/or cheese, and sprinkled with powdered sugar. The most famous bugatsa is served at Kipkop in Heraklion, founded in 1922 by Armenian immigrants who serve up the same recipe to this day. While filo dough isn't a dessert per se, it's the foundation of many desserts on Crete, including the ubiquitous baklava. You’ll never look at filo dough again in the same way after visiting George Hadziparshos' bakery in Rethymno (Address: Verbadov 30). He takes a small ball of dough and in his methodical way stretches it over a burlap covered mattress — without a single tear, bubble or hole. Amazing. It’s hard to visit Crete without drinking raki — a couple of times a day. Although raki is made in the same way as Italian grappa – from the remains of grapes (pits/skins) – it is fortunately smoother and less potent. And, it’s almost always served with food like savory little snacks or dessert. A typical spread to pair with raki at a local Cretan cafe. When it's time to make the raki (October-November), Viki explained: “I can hear the smell of alcohol.” Yes, you can literally hear the crackling of the wood and the sound of raki stills piping away. Then you know it’s time to join friends and neighbors to eat, drink and fill up bottles of raki straight from the still. Crete is one of the Greece's biggest wine producers. Most of the wine that we tried was of the local village homemade variety. While most of it was acceptable table wine, it didn't strike us as exceptional. However, one of our guides gave us a bottle of her husband's red wine and we were convinced that Cretan wine could, in fact, be truly excellent. In the middle of the day or at its end, look for herbal teas. Never thought you could make wild oregano tea? You can, and it's nice. Mix and match herbs, or better yet, let your knowledgeable host do it for you. And stay on the look out for malotera, or mountain tea. A great way to keep your body hydrated and refreshed as you eat your way around the island. Disclosure: Our trip to Crete was supported by Visit Greece. Most but not all expenses have been paid for. As always, the opinions expressed here are entirely our own. And we'd like to give a special thanks to our guides from the Crete Guide Association – Viki Vlachaki, Katerina Tsagaraki, Ioanna Glypti, Stavroula Stratigi and Vasso Katsantonis – for their personal introductions to Crete's cuisine and culture. Um, I was mentally stuffed and needing to be rolled off your blog when you got to “something more substantial, main courses” …now I think I need to go eat my way through Crete for a solid month. @Emily: We certainly didn’t get to all Cretan food specialties in our week there, but tried to provide an overview of the highlights. You could eat your way through Crete for many, many months! @Christy: Isn’t that statistic of 25 liters/person amazing? But the olive oil on Crete is such high quality and light that it doesn’t feel heavy. Yes, you eat the grape leaves with the dolmades. They are marinated and soft – very easy to eat. This is sort of a silly question, but for the Dolmades – do you eat the grape leaves, or just open them up and scoop out the contents? @Roger: We appreciate the kudos on this article considering your experience and knowledge of Crete. Our guides took very good care of us during our last visit, but thanks for the tip regarding Yiannias. @Tigranuhi: Yes, dolmas are found in so many countries in the region. Although, a lot of the dolmas we ate in Armenia were cabbage or peppers stuffed with meat and rice instead of grape leaves. Excellent review of food in Crete. This is accurate and also a beautiful presentation. Suprised though, you missed – good tip for next time (? )- being in contact with Yiannis at CreteTravel. It seemed to me I visited an Armenian restaurant, when I saw Dolma! What is this! So Armenian: Dolma, Lavash. Wonderful pictures, engaging post of yours. I am first time here, and will be around and read and learn about the exotic things you shared here Audrey. Thanks for the great experience you gave me. Great article. I don’t think I’ve ever read one focused on the cuisine of Crete before. Thanks. Absolutely gorgeous food photos and great writing about Crete food! I have never been myself, but last fall my boyfriend and I went to Greece and we loved the food there. One of my favorite parts of traveling is tasting all sorts of ethnic dishes and treats. @Lane: We tend to go deep into the cuisine everywhere we go, so we try to share what we’ve learned along the way in the hopes that other people also have good eating experiences there. Glad you enjoyed it! @Vicky: Thank you!! Dan and I don’t have much experience in the rest of Greece, so I’m curious to visit other areas and compare the food. What we found on Crete was very different than what I associated with Greek restaurants back home…but that may be the fault of the restaurant. Delicious food after seeing this food I really fell hungry. That food is really looking so delicious. I was actually drooling over it. Thanks for sharing the post. @Mary: Always love it when family members carry on culinary traditions from their home countries. Your grandmother’s cooking must have been delicious! @Edna: If you’re a foodie and traveling through Europe, I’d definitely add Crete to your food destination list! But, be sure to go where the locals go as there are a lot of touristy restaurants on Crete as well. Wow, way to inspire food wanderlust! Definitely adding “eat my way through Crete” to my European must-dos now! I really like the way you have presented this post – the food pictures are delicious to look at and the information interesting. Thanks. Cannot wait to be there again. Going in to the hills and mountains to find the small tavernas and great food. Nostimo !! Having willingly exiled myself from the UK to live in Crete I am lucky enough to savour the food you have described, and so clearly photographed on a regular basis. My UK blood test show that my cholesterol level has dropped from 5.1 to 4.7 in 2 years which shows the healthiness of the diet. There are 30 million olive trees on Crete – I own 55 – planted in 160,000 hectares and cared for by 95,000 families. To distinguish Cretan olive oil which is recognised by the ‘foodies’ of the World to be the best olive oil is referred to as Cretan Extra Virgin. Everything looks so delicious! The Greeks really know how to eat. @Jan, Linda & Piet: Thank you! Glad you enjoyed this round up of Cretan food. @Roger: We thought we knew good olive oil before our visit to Crete, but it was like a whole new education in olive oil. Not only was the taste of the olive oil different, but it tasted lighter, healthier. Glad to hear your health has benefited from living on Crete and enjoying its fresh food. @Andrea: And it was delicious! We don’t know about the other parts of Greece, but on Crete they definitely know how to eat and have a good time! Wow, can I run to my local grocery store now, I’m starving! I haven’t been to Crete (yet), but spent a good amount of time on the Greek mainland and the islands, and what I loved the most was the amazing food, which you guys captured perfectly in your photos! It’s totally true, as a people they love to eat and have a good time. @Liz: We were really impressed by the quality of food on Crete, so I’m heartened to hear that you had similarly good food experiences on other Greek islands. And you’re right, eating isn’t just about consuming but about the sharing and communing experience. It’s a great way to live. Wow, I can’t believe how hungry I got just by looking at all this wonderful food. My ethnic background is not very close to Creten (Cretian? ), but for some reason everything I find everything Mediterranean – and this seems to be the epitome of Mediterranean – incredibly delicious. @Boris: The thing that makes the Greek salad so great (and perhaps so Greek) is the fresh vegetables and herbs. And on Crete, herbs and greens rule the day. Speaking of rules, there seem to be no hard and fast rules regarding what you might find in a Greek salad on Crete — so long as it’s fresh. Cheers to Ouzo. If I understand correctly, it’s roughly raki distilled with anise. Powerful stuff. Cretan kitchen is amazing and even as a vegetarian i could really enjoy it! but the origin of ingredients. but for the best of cretan food-you have to go to Crete!!! @Simon: That’s the idea — with food in Crete or anywhere for that matter — gotta make it look as good as it tasted. The food – oh, what can I say? impressive – good taste and so healthy. I recomende to everybody to try it … fabulous. It impressed me so much that In 10 days in Crete, without any diet, and eating more than on my home … I lost 3 kilos … so, for the first time in my life I realised it is something good pon a diet – and this was the cretan diet …I relised it is a very heathly diet and helps to loose weight … So I continued to use at home cretan recipes for my food … I feel great eating on cretan way . I recomand to everybody to try cretan recipes … even we have not the cretan ingredients … but the cooking way … it should be known by everybody! And congratulation to Ioanna for her work to make this Island known for people that never been there. One of the best written – â€œphotographedâ€ articles ever written about Cretan Diet! That’s an opinion from a local that has tried a lot of cuisines of northern Europe. Bravo! Wonderful article and beautiful photography. Greek cuisine is one of my favorites, though I’m not well informed as to what foods are typical or traditional Cretan. It just seems so simple; fresh, fragrant and flavorful. I was so impressed by the photos in this article, that I had to prepare myself a bowl of greek yoghut, honey and nuts to enjoy while reading the rest of this article. What a great way to start a Monday. Thanks! @George: Having lived in a northern European country for a bit, I can imagine how excited you are to eat Cretan food as a contrast- so fresh and different. @Marina: Thanks so much for stopping by and commenting. That you, as a Cretan, thinks this article is good and accurate really makes our day! And you’re right – reading about Cretan food is nothing compared to actually tasting it. @Barb: I remember most dairy products on Crete using cow or sheep’s milk, but the most of the bread does probably use yeast. The best thing to do is to ask the hotel where you are staying to write a note in Greek about what you are allergic to in very specific terms. Emphasize that you will get very sick if you consume any of this (no restaurant wants an ambulance sent to it). That way, even if the server at a restaurant doesn’t have good English he can read the note in the local language and can adjust things, if necessary. excellent overview of the food scene in my homeland – great photos, wonderful commentary ,glad you enjoyed it all! 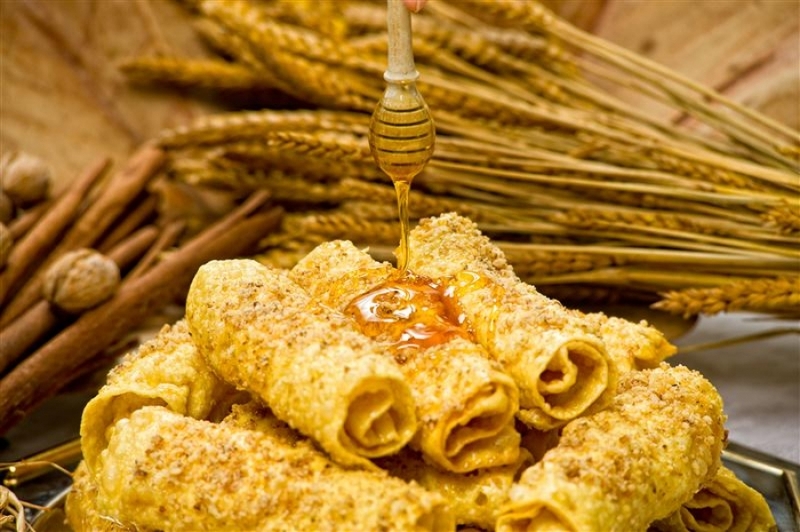 I am doing tours to Crete in 2014 and have been describing the food! I really want people to experience how wonderful it is there. @Hadassah: The food in Crete is so fresh that I can’t imagine that your tour group won’t be so excited by the trip. Good luck! Nice post. We will be traveling independently, with a car but without such excellent guides as yours. How feasible is it to find these your recommended out of the way restaurants, or to get “the good stuff” at the little tavernas that don’t have menus? Is there a book or website with Greek translations or spellings of all these foods? Thanks. Glad you found this useful for your upcoming trip! You’ll find that a lot of people on Crete do speak some English, so you can likely ask in towns and villages for small, local restaurants. If you have the name of a place, just keep asking in villages until you find it. One of the tricks that I’ve learned over the years is to ask someone where they eat dinner/lunch instead of just asking for a general restaurant recommendation. As for getting the Greek translations for dishes, you can also ask people at the hotel where you’re staying to write things in Greek. You could also download an app for your phone like iTranslate. I’m sure you’ll have no problem finding lots of delicious food on your journey! Sound, accurate and helpful Audrey. Adding that, seems to be an often asked questions, though meat reigns as the highlight for many in Crete, there are few better places to find big, meaningful and varied salads and even cooked vegetable dishes. Many tavernas in Greece do in effect serve “home cooking” as many are run by the family who also eat their meals – same as the ones you enjoy – right there. Thanks, Roger! And thanks for adding that hearty, delicious vegetarian dishes are also easy to find on Crete so vegetarians need not fear. I was born in Crete and i have to say that it is an excellent article about the cretan kitchen! Thanks, George. 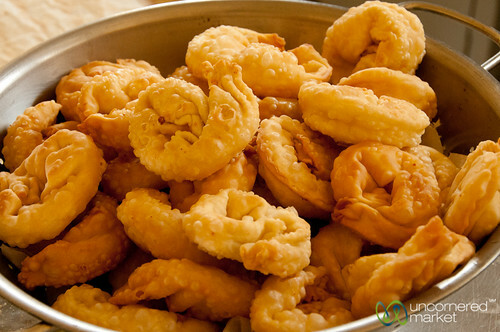 What was your favorite food while growing up on Crete? The Secret of Crete not only recipes but also in the soil. This course does not apply only to Crete, but in general for the province. Led by experts of the world to turn their interest in the “phenomenon of Crete” as it was called, thanks to the longevity of the population of the island. Thanks, George. I love your characterization of “non-tomatoes” on the Greek mainland. So, it must be the soil on Crete that dates back to the island’s creation. As for the diet, it makes sense. It seems nowadays, though, that the diet is changing (as it is everywhere) as people on Crete become wealthier and consume more expensive (and not always local) cuts and types of meat. Thanks so much for the suggestion of diples and karidopita. Both look quite tasty! I’ve spent about 6 months living in a small village in Crete. You definitely experienced the true Cretan Diet! My aunt prepared all these delicious specialties for me and I felt so spoiled. I tried to document my eating experiences and I had a couple articles published. Your overview is awesome I hope you like mine! Thanks, George. Glad to hear that we received the classic — and authentic — Cretan culinary experience! If you’re traveling on the east side of the island in Irapetra or Kavousi check out κρητικά εδέσματα (Kritika Edesmata). The Kasotakis family produces absolutely divine sweets and pastries using traditional techniques and ingredients from their orchard & apiary. They’ve got handmade pasta, herbs, honey, and olive oil for sale in the shop as well. They were so nice to and were happy to answer questions!